Heading into the 2011 holiday season its beginning to look like getting a lump of coal for Christmas might not be such a bad thing as it can at least be converted into fuel for electric vehicles like the Volt and Leaf. Absent that, or a dramatic end-of-year retreat in fuel prices, we’re all going to be paying record amounts to drive home to visit family as gas prices are at historic highs for this time of year. 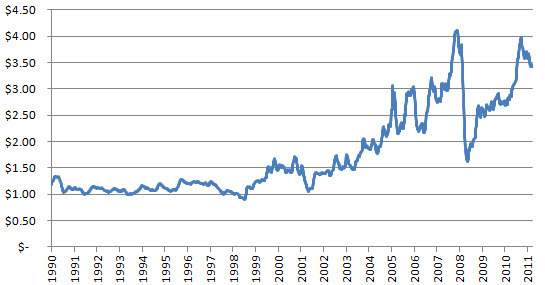 Looking at the above chart of average weekly retail gas prices from 1990 to the present one can clearly see the two spikes in 2008 and then again this past summer. At first glance it appears that this year’s trend mirrors that of 2008, with gas prices rising rapidly heading into the summer months only to be followed by steep declines in the fall. However on closer inspection it turns out this is not the case. During the 2008 spike a record high price of $4.11 a gallon for regular grade gasoline was reached the week of July 7th, a price which subsequently cratered to nearly half that amount by the first week of November. This year’s trend has been quite different with the peak price being reached much earlier in the year (May 9th) and the seasonal drop-off much less dramatic as gas prices are now only 14% below this year’s peak price of $3.97. 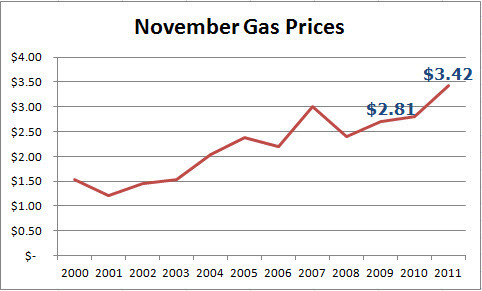 Taking a look at the historical price of gas for the first week of November reveals that gas prices are 22% higher than they were heading into the holidays last year and at the highest price ever for this time of year. This despite the fact that the Arab Spring is far behind us and the removal of Qaddafi from oil-producing Libya is no longer in doubt. 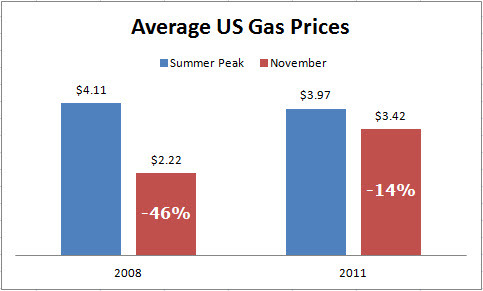 So what does this mean for gas prices heading into 2012? Although the US Energy Information Service doesn’t see a return to the near $4 peak we saw earlier this year, some analysts disagree. “I think we will see prices in 2012 that will break … records” said Tom Kloza, chief oil analyst for the Oil Price Information Service. 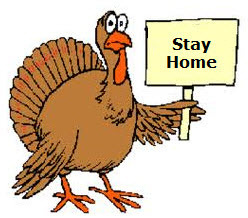 Don’t be caught off guard by high gas prices this holiday season. 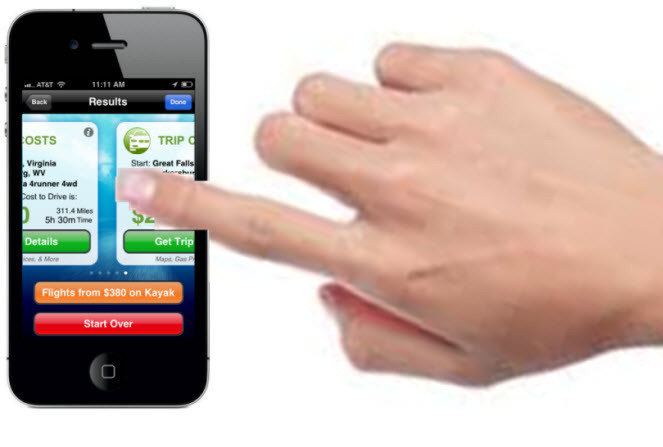 Before heading home for the holidays be sure to check out the Cost2Drive website or our new Cost2Drive iPhone app to see what it will cost to get there based on current gas prices along your route. 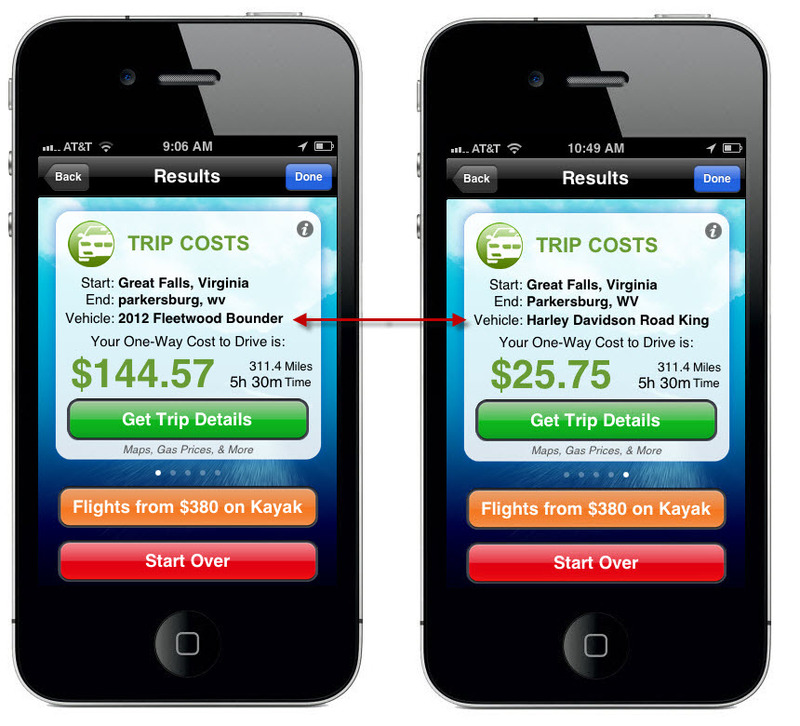 It will also help you save money by locating the cheapest gas at refueling points and displays the cheapest airfare so you can see if it will be cheaper to drive or fly home.